Park County IT Department is committed to providing technology support, training, consultation and analysis, and solutions for its employees as well as the City of Livingston's employees. We work mainly in the City-County Complex office, but also support the City and County's outer lying offices. We plan, implement, and support technology that allows County and City departments to function efficiently while providing security and integrity of the County and City's systems and data. Employees may contact the IT Department by e-mail, in person, or by phone. 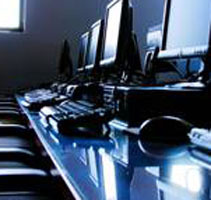 Computer equipment moves or setups; computer/network account issues; e-mail assistance; various software installation or support; new printer or scanner setups; printer toner/cartridge replacements; laptop support; wireless or network access; telephone or voice mail issues; report virus, malware, and spyware issues. Park County's IT infrastructure has been growing in leaps and bounds. Over a year ago, IT started replacing servers, switches and then CAT 5e-6 cabling....Take a look at this linkand view the before and after pictures of the latest Cabling Project. Send detailed e-mail to Park County's IT department if you are able, and include details/error codes, etc. For after hours, please call the IT phone number: 406-222-4197 and press option 1. Your call will be routed to the on-call technician for that week.